On Saturday May 6, 2017 from 10am to 1pm join us for the 12th Annual UW Family Gardening Day at D.C. Smith Greenhouse, 465 Babcock Drive; Allen Centennial Gardens, 620 Babcock Drive; and Steenbock Memorial Library, 550 Babcock Drive. You can park nearby at Lot 40 (460 Babcock Drive), Lot 36 (1645 Observatory Drive) and Lot 34 (1480 Tripp Circle). UW Family Gardening Day gives everyone a chance to see & explore some of the splendid facilities for teaching, research and outreach in the plant sciences as well as to tour the beautiful gardens on campus. We look forward to seeing you there! Tour D.C. Smith Instructional Greenhouse and look at insects under a microscope, learn about research happening at the UW Biotron or construct unconventional flower arrangements. Join Us March 20th and 21st! 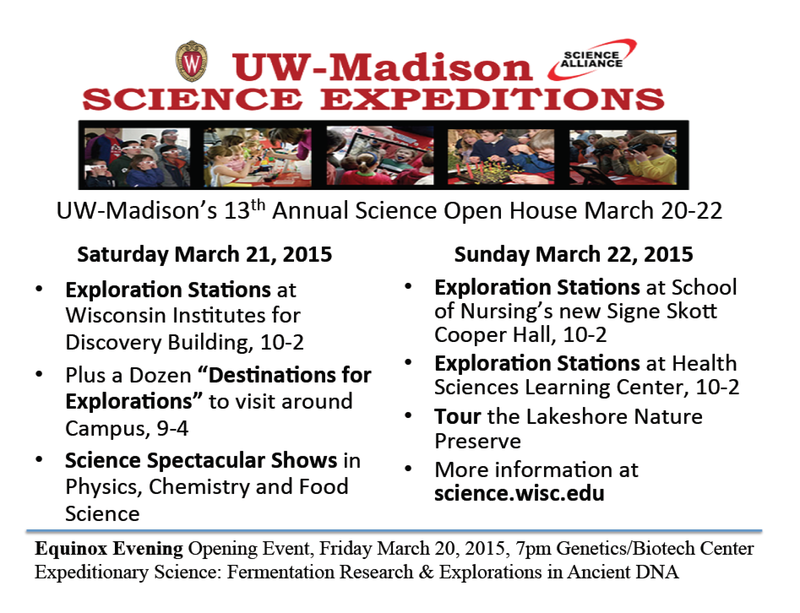 Join us during Wisconsin Science Festival! The Wisconsin Science Festival is next month. The DC Smith Greenhouse will be part of the action on October 16th and 17th. From 9AM to 2PM both days we’ll offer hands-on activities and plant science displays. Stop by to experience the fascinating world of plants! We’re just a short walk from the Discovery Center and on the way to the Babcock Dairy Store! It’s the start of a whole new school year. We’re looking forward to seeing you in the greenhouse! Feel free to stop by for a study break in the conservatory or to check out what’s growing in the greenhouses. Join us May 10 to kickstart your garden! We’ll be on hand from 10AM til 2PM to share our know-how and enthusiasm for plants and gardens. Thanks to everyone who visited us for Science Expeditions 2014! Check out our facebook page to see the cool arrangements that you made. We are open weekdays from 8-4 or visit us Saturday, May 10 for UW Family Gardening Day! Brave the cold for a sign of spring at the Wisconsin Garden Expo! Greenhouse manager Johanna Oosterwyk will be joining other staff from UW-Extension and the CALS Agricultural Research Stations in the extension booth. Dennis has had lots and lots of visitors since Thursday morning. We have asked people to leave their comments. Here are some that were left on Thursday. As of 1PM today our titan flower started to open! We love company so feel free to stop by Thursday or Friday to experience this unique flower. We will remain open today and tomorrow until 9PM. The DC Smith Greenhouse is on the corner of Babcock and Linden Drives on the UW Campus. We will be open Thursday and Friday until 9PM while the Titan is in bloom.